Only three years along in their collaboration, the Atlantis Quartet is growing its reputation as one of the most creative and daring bands in the Twin Cities. Four of the most innovative jazz artists in the area, the group includes saxophonist Brandon Wozniak, guitarist Zacc Harris, bassist Chris Bates and drummer Pete Hennig. 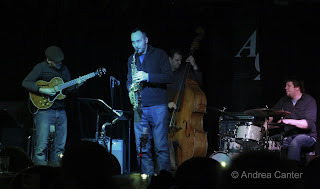 After a promising debut recording, Again Too Soon (2007), the band tackled two classics of modern jazz in live performance, John Coltrane’s A Love Supreme and Herbie Hancock’s The Head Hunters. 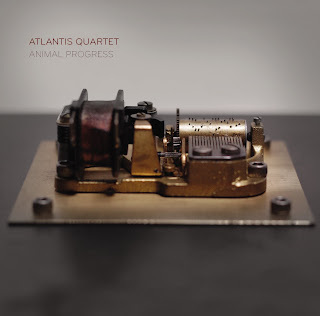 Now the Atlantis Quartet again highlights its primary direction of original music with its second release, Animal Progress, Again, it’s another winner, and for fans of the quartet, it’s definitely not too soon! Part of the delight of Animal Progress is the diversity of the compositions. Drummer Hennig’s work opens (“Verge”) and closes (“Bottles N Cans”) the set, and in between, we’re treated to “Red Headphones.” The opening theme has a Monk touch with its jerky, shifty rhythms. Chris Bates’s bass literally bounces across the sound page, followed in kind by Harris. Hennig’s framework becomes more and more up front, while the two strings intertwine in an engaging duet. Wozniak solos over this delightful mash, adding concentric layers of notes as Hennig stokes the furnace, finally taking over completely. Brandon Wozniak proves his writing chops are every bit as stellar as his saxophone skills (which hint strongly of his studies with Chris Potter). His “Radio Games” has a classic bop feel with 21st century sonics. The composer is at the improvisational vortex, taking apart the wide expanse of the alto for exploration, while Bates has a doubletime good time soloing. Wozniak’s “Ballad for Ray” (Ray Charles?) has a gospel flavor, like a country hymn. The bass and guitar combine again for an almost accordion like sound, while the alto sax winds its way around a melodic, solemn core. Zacc Harris offers the aptly titled “Eastern Horizons,” with a Middle Eastern vibe suggesting belly dancers and aromatic spices. Hennig’s percussion gives it a lot of oomph (or maybe its “oompah?”), a bit of East Meets the Tropics. Harris’s guitar effects suggest a sagging accordion, and his solo continues the eerie sound and whirling motion. Another standout composition, Harris’s “Meltdown” starts with the restrained fury of a locomotive, largely fueled by the strings, particularly the composer’s single-line ramble. Wozniak grabs the tension and runs with it, while Hennig and Bates ensure an anxious pulse. Chris Bates wrote “Ripples,” centered around a bass vamp and whiney horn motif that sets up the tune to work a few notes from all angles. The harmonizing among sax and guitar produces an electric vibe—ripples of sound. Harris takes over with serpentine phrases over Bates’s counterpoint, while Hennig maintains continuous crackling, popping support that occasionally erupts into pounding pepper spray. Bates own solo is a workout of few notes, many ideas.